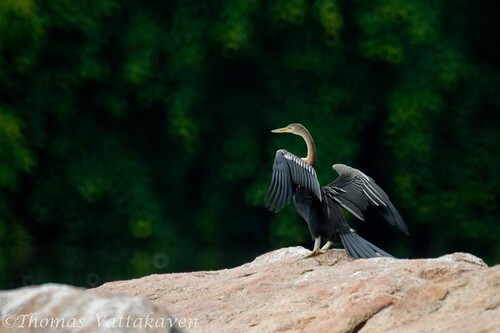 The Oriental or Indian Darter (Anhinga melanogaster) is also known as the Snake-bird due to its long snake-like neck. 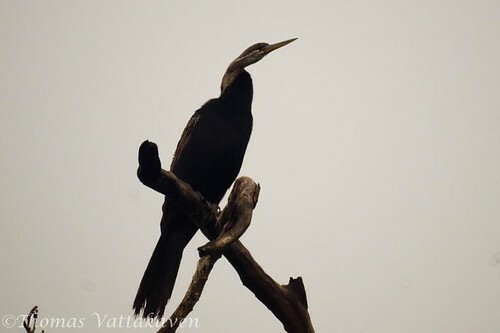 It is a large black water-bird with a long beak. The sexes are alike. The crown and neck is brownish and all feathers have a pale edge. The distinctive feature is its white lateral neck stripe. The back is black with the wings having silvery white streaks. The iris is yellow, bill yellowish. The tail is long and wedge shaped. It frequents fresh water that is deep enough for it to swim and dive in. It may be found in estuarine areas but it does not visit seas. 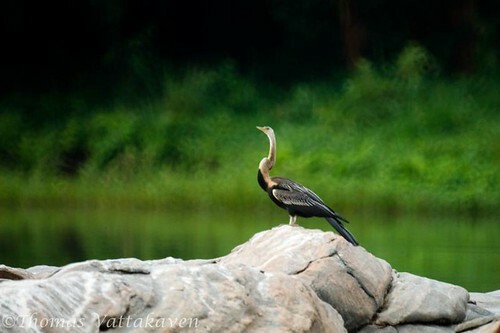 It is a social bird and occurs with colonies of little cormorants. 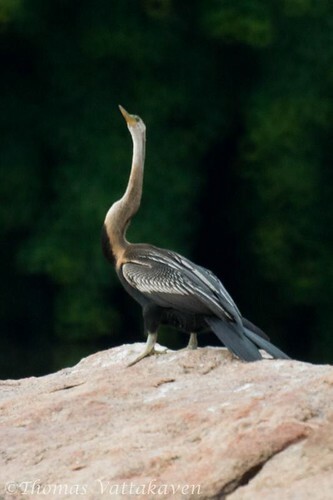 This is a highly specialized bird, adapted to the capture of fish. It swims very low in water with only its neck and hed out, resembling a snake, its head turning from side to side as it looks for fish. As fish swim past, the bird darts its beak downwards and impales it or catches it with a spring like action which is made possible by its unique 8th and 9th vertebrae which acts like a spring. It also catches fish while swimming underwater or by diving from its perch, then tossing it in the air and catching the fish in its beak before swallowing it head-first. The breeding season varies but is mostly in between January to May. 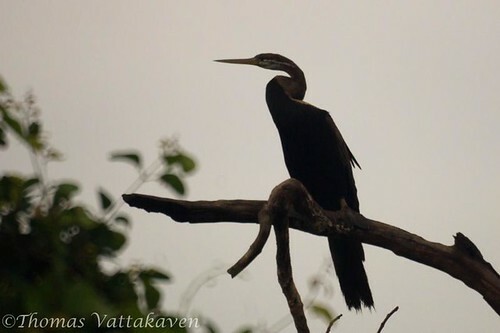 The nest is a mass of sticks in clumps of trees along with cormorants and herons. The same nests may be used year after year.